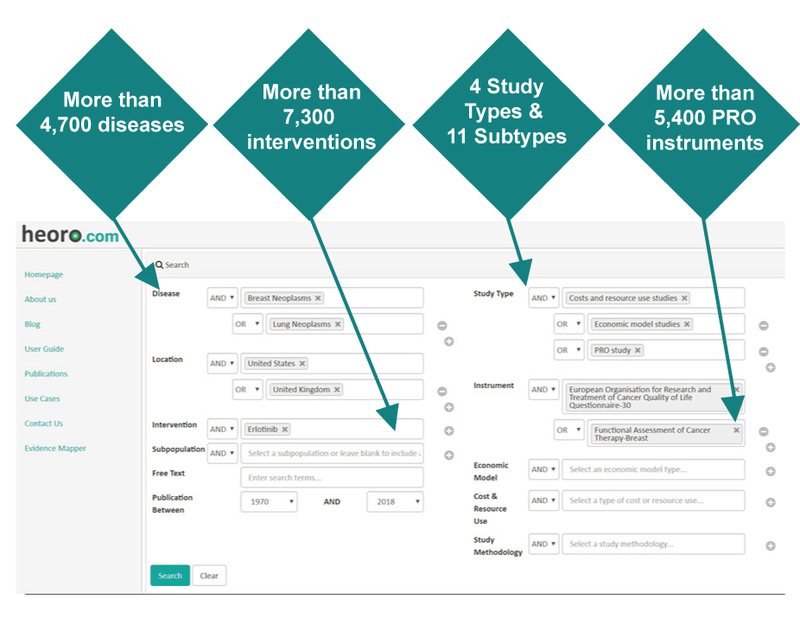 Heoro.com is a database of pre-screened studies relevant to the humanistic and economic burden of disease, indexed using our customised semantic ontologies for disease, interventions, patient-reported outcome tools, geographical settings, economic burden and model types. We’ve used innovative text processing and support vector techniques to ensure comprehensive coverage of relevant PubMed-indexed studies, with more than 95% accuracy for indexing of humanistic and economic burden study subtypes. Our HEOR and clinical experts then take the time to check and index the studies by topic so you can save time and money in finding the data you need to develop your model, patient reported outcome (PRO) instrument or dossier. Users filter the database by a series of Boolean searches, adding specificity to their searches. Abstracts can be filtered by relevant ontology terms and study subtype categories, combining terms both within and between each category. Run as many searches as you want using the free-access dashboard. There’s no need to register or sign in. The perfect way to identify key papers for model parameterisation, PRO instrument development or market access dossiers. The Crystallise literature review team conducts a range of evidence synthesis services for clients, from rapid overviews to full systematic reviews to support an HTA submission. We use established methodological approaches and search multiple sources including PubMed, Embase, the Cochrane library and grey literature sources, but we power the search with heoro.com. Because abstracts are accurately pre-indexed, we can search for humanistic and economic burden publications for a broader disease type, or going back further to include earlier publication dates, without having to screen thousands more abstracts. Clients therefore get the methodological rigour needed for an HTA submission, with additional publications on utilities, costs and resource use or economic models, without increasing costs or delaying deadlines.